In this post, I have written about a specific Indian Paranormal Remedy for protection from harm from Lightning strikes. This remedy, which is called in Hindi as Bijli Se Bachne Ka Totka- Upay is most simple to practice and yet the Tantra says that it is most powerful and effective in protecting the practitioner from injuries and even death from lightening strikes. In this post, I have described a couple simple traditional Indian healing home remedies for getting relief from Urticaria. Urticaria, also called Hives or Pitti in the Hindi language is a common yet most painful and irritable dermatological disorder. Urticarial disorders are normally caused due to some or the other kind of allergic reaction, even though it is a short term skin disorder, it can cause great discomfort and anguish, due to the urge to scratch the itching skin. In this post, I have described a unique healing remedy, which makes the use of the Gayatri Ramayana and the Gayatri Mantra for healing any kind of eye diseases and ailments, including poor eye-sight or any other disease or ailment connected to the eyes or vision. 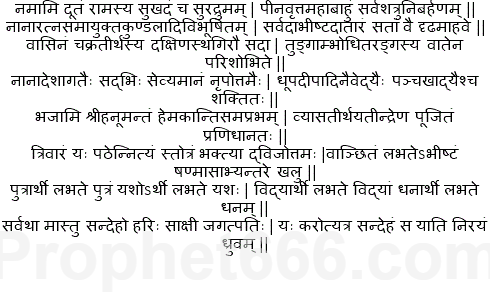 There is some sort of hidden connection or code, which links the sacred Gayatri Mantra with the Ramayana. 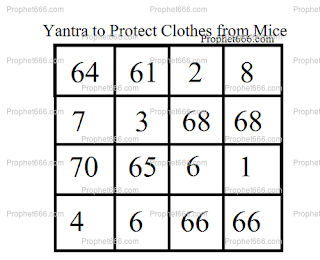 A specific Hindu Yantra, which acts like a charm or a protective talisman to prevent mice rats and other rodents from damaging and destroying clothes and fabrics has been described by me in this post. Mice and the other similar rodents are known pests who chew, tear, make holes and destroy clothes thus causing great agony to many people. 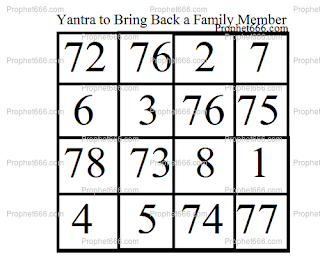 This Yantra, which is simple to make and use can be used these people who are being harassed by mice and looking for a paranormal remedy to put an end to their suffering. Today, I am writing about an astonishingly powerful Hanuman Mantra Sadhana. This Mantra Sadhana is very similar to the one described in the post "Hanuman Shakti mantras for success". 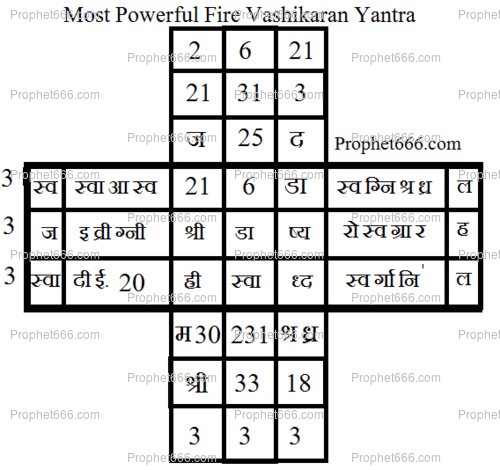 This Vashikaran Yantra described in this post is a standalone Indian Voodoo Attraction Charm, which is said to combine four kinds of Vashikaran Kriyas namely clothes, fire, ash and food. This Yantra is as per the Tantra used to cast a most powerful enchantment spell on a chosen lover whose love and affection the practitioner is pining for and desperately wants to come close to this sought after lover. In this post, I have written about a very interesting and simple to practice Indian Mantra Experiment, which is said to specifically tackle the most irritating and agonizing problem of Bed-Bugs. The usual off the shelf insect sprays available in medical stores do not work on Bed-Bugs. It is very difficult to completely eradicate Bed-Bugs, once they have made inroads into your house as they possess a most powerful immune system, which ensures that they gain immunity from these insect sprays after some time. Some special people in this world dream about being independent and powerful, which means powerful without being dependent on others or relying on the support of other persons. There is a special Indian Yantra, which acts like a Good Luck Charm and is said to fulfill this desire of the practitioner, the details about how to make and use this Yantra are explained below in this post. 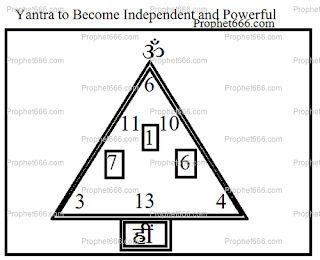 In this post, I have described how to make and use a most useful Yantra to get a specific work, job or task done. This is a special standalone Good Luck Charm, which according to the Tantra will aid and help the practitioner in succeeding in that particular task. If the practitioner is competing with some other persons for a particular job, position or contract then the use of this Yantra is said to give him that cutting edge. In this post, I have written about a most simple traditional Indian Paranormal Utara Tantra to remove and exorcise malefic and regressive energies and vibrations from the body, aura and surroundings of a sick and ailing person. This remedy can be performed if the sick and ailing person is not responding to medicines or to any other kind of on-going medical treatment or if there is continuous sickness, ill health and disease present in the house. A very simple method of healing common every day ailments and health problems like headaches or fever is to infuse water with the sacred Gayatri Mantra and to consume this Gayatri Mantra infused water like a healing medicine. In this post, I have described a couple of easy to perform healing remedies, which can be useful to the regular chanters of the Gayatri Mantra or the lay-person. In this post, I have written about a very simple and easy to perform Surya Arghya remedy for getting rid of fear or fright, this includes fear or feeling frightened and scared for no reasonable rhyme or reason or with any reasonable cause. This Surya Arghya [offering water to the Sun God] remedy can be very useful for those people who are undergoing mental anguish due to unnecessary fear or fear from unknown reasons. A large majority of Indian marriages are arranged matches, which are usually arranged through a match-maker, marriage bureau or through the friends or relatives of either the bride or bridegroom. Many a times it so happen that the boy might desperately wish to get married to the girl or vice versa. The Vashikaran Mantra posted by me in this post is especially for putting an Occult Attraction Spell on the would be bride or bridegroom so as to ensure that they do not reject the match.